In order to ensure the perfect fit for your curtains whether they are Made to Measure Curtains or Ready Made Curtains it is essential that the measurements you provide are exact. The following guide carefully instructs you as to how to measure for your curtains. First we will explain how to calculate the width measurement. 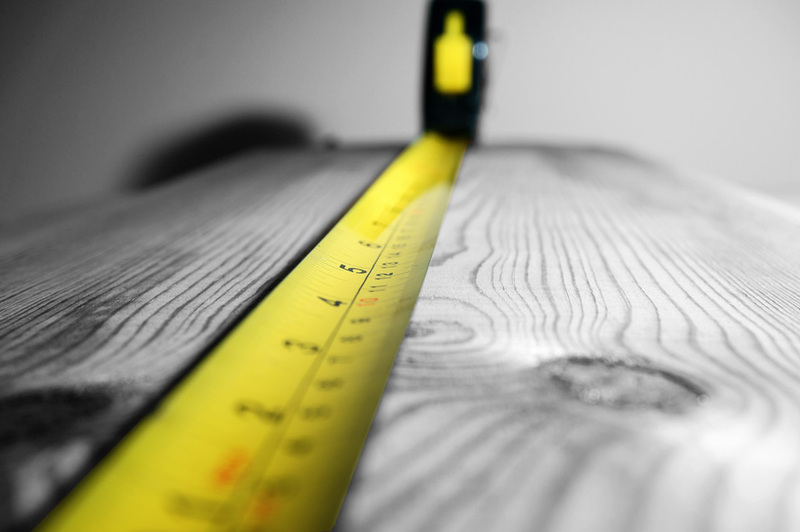 The width measurement should be the length of your pole or track. For poles this should not include finials. 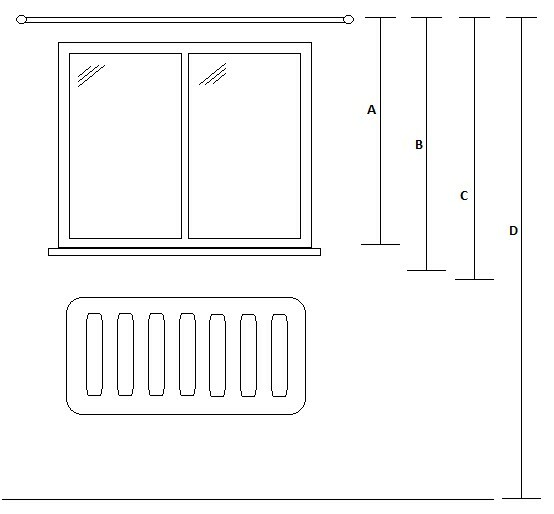 Note: If you have not yet ordered your poles or tracks then you should allow an additional 15cm either side of the edge of your window (your windows reveal). When measuring your track measure the full length of the track, when measuring your pole measure the full length of the pole NOT including finials (decorative end pieces). 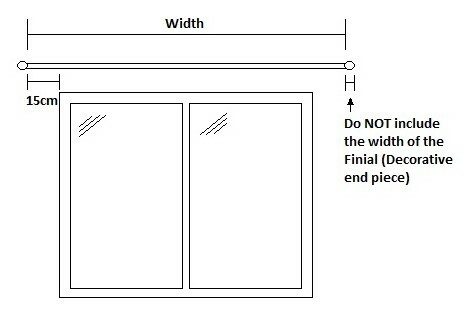 Please see the Image 1.1 below for an illustration of the Curtain Width. For optimum accuracy it is advised where possible to use a steel tape due to the possibility of plastic tapes stretching through prolonged use. If you have an overlapping curtain track please ensure that you measure the overlap, simply measure the overall length of the pole ‘Length A’ then measure the length of the overlap ‘Length B’. 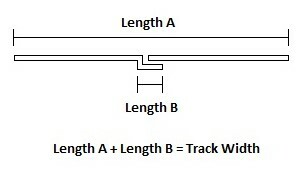 Length A + Length B = Track Width. See Image 1.2 for the measurement of overlapping poles. Drop A: 1cm above your window sill. Drop B: 15-20cm below your window sill. Drop C: 2cm above your radiator. Drop D: 1cm above your floor finish. You should always measure at least 3 different positions across the width of your pole to ensure compensation for unlevel floor finishes of unlevel fitting of the pole itself. It is recommended that the shortest of these 3 measurements is used, this avoids curtains dragging on radiators, sills or the floor. Always measure from the top of the track as indicated in Image 2.1 (Do not take into account finials). For Pencil Pleat and Pinch Pleat Headings always measure from the bottom of the underside of the pole ring, to allow the pole to be seen above the curtain as indicated in Image 2.2. However, when measuring for Tab Top or Eyelet Curtains the drop should be measured from the top of the pole (ignoring finials), exactly the same as the measurement would be taken for a track. Our specialist consultants will automatically calculate the exact quantity of fabric required to give the optimum level of fullness to your finished curtains. However, should you require your curtains to be particularly full, or the opposite, then please advise our consultants accordingly when placing your order. For any unusual, obscure or awkward windows please do not hesitate to contact us and we will advise you on the best way of measuring for your curtains. However, if you prefer Merlin Interiors can always come and undertake the measurements for you, please contact us to enquire as to the cost of our measuring service.